Welcome to Scanner.co.za – South Africa’s leading supplier of Desktop, Production & Departmental scanners. With our extensive knowledge of document imaging and associated activities, we are able to provide you with the right scanner for your needs at a competitive price. 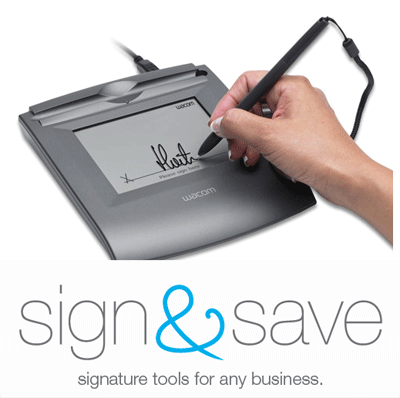 Sign&Save and Sign&Save Mobile, are compact and robust plug & play signature capturing solutions providing efficient workflows with less paper – either mobile for anyone who works frequently with documents while on the move, or stationary at public counters. Sign&Save and Sign&Save Mobile, include Wacom sign | pro PDF software and are designed for capturing signatures, especially for smaller businesses with one or more branches: consultants, small independent dealers, service companies, agencies, hotels, doctors, repair shops, car resellers, industrial rental services, architects, marketing agencies, healthcare service organisations. Stop printing, signing, scanning, archiving, transporting and retrieving heaps of paper.